We are manufacturing and selling solar stoves and promoting green activities such as solar panels. The most common cooking fuel in urban Zambia is charcoal1 , with firewood also used in rural areas. The burning of fuels for cooking causes indoor air pollution and consequent health problems, as well as carbon emissions and deforestation. Solar stoves allow people to cook with reflected sunshine, without any need to obtain fuel. Cooking with the sun has health, environmental and economic benefits. We are passionate about sharing this exciting technique with more people in Zambia. We are looking for support to obtain equipment to set up a workshop for making these stoves: drill machines; electric circle saw; bench; spanners; scissors etc. We will also need to buy materials to make the stoves – we would like to start with 10 box cookers; 5 parabolic cookers; 5 solar food dryers and 5 heliac solar cookers. Rosa Solar Stoves is situated in Los Angelos Road / John Laing 63/55 in Lusaka, Zambia. It is a company registered by the Registration Office PACRA: Patents and Companies Registration Agency in the Republic of Zambia. It is registered under the index number BN No. : 320180000990. 1. Solar Photovoltaic System Solar pump equipment / 210 W / 24 V - This system can be used in hospitals for water and sanitation. Access to clean water is very important for hospitals, allowing them to maintain hygiene and treat patients more effectively. A solar pump can move water from a borehole to a tank using energy from the sun. Water from the tank is then available whenever it is needed. - In the agricultural sector, the system can provide water for farming activities and fisheries. - It can also be used in education, as schools, nurseries and universities all need water for their activities. 2. Solar cookers If we all used solar cookers, we would: – Reduce air pollution and promote health. Our towns and cities would be cleaner and more pleasant, and people would no longer cough and choke whilst cooking dinners on a smoky fire. In Zambia in 2015, 74 people per 100,000 died as a result of diseases related to indoor air pollution . – Reduce deforestation. When firewood and charcoal are used for cooking, this means valuable trees are cut down. Zambia currently has one of the highest rates of deforestation in the world . Cutting down trees can cause the loss of top soil, a reduction in rainfall and reduced soil fertility. In this way once fertile regions turn into desert. Cooking with the sun means there is no need to cut down trees for cooking fuel. - Reduce climate change. Emissions of carbon dioxide are driving the climate changes that are leading to unpredictable droughts and floods across the world. By protecting trees, and using the sun instead of burning fuel, we can reduce emissions and help to tackle this global problem. - Improve nutrition and tackle cholera. Foods slow-cooked on a solar cooker retain their nutrient contents and vitamins well. 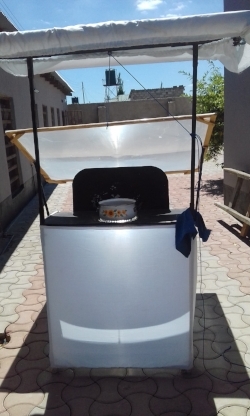 Solar cookers can be used to pasteurize water for avoiding water borne diseases such as cholera and typhoid fever. Education about solar cooking can be combined with health activities and nutrition programmes. Solar cookers can also be used to dry foods and preserve them for longer. - Create jobs. We will need people to construct solar energy ovens and dryers in our new workshop. Other important jobs are to provide education on solar cooking methods, and to sell the cookers. We have experience with using a range of different solar cookers for cooking, drying and water pasteurization. Parabolic solar cooker: These cookers reach higher temperatures so can be used for frying. Heliac Solar cooker : We used it to boil water to help stop cholera. 4,202 people became ill in a recent cholera outbreak, which killed eighty five people in Zambia, mostly here in Lusaka. Solar food dryer : Drying is the easiest and cheapest method of conserving food. A solar dryer can considerably speed up this process. The warm air draws water from fresh food and thus conserves it without destroying vitamins and without affecting the nutrient content. Food to be dried is cut in halves, sliced or shredded and placed on the screens. Fruit should not be too ripe and juicy to avoid dripping. Tea leaves and herbs should be dried without very large stems. The length of time with any drying procedure depends on the water content of the food, the temperature and the humidity in the air. Tea and herbs only need a few hours but tomatoes and fruit may take several days to dry. The solar dryer can be used in health, agriculture and education; saving energy and helping the environment. Each tray can take 5 kgs of food. The dryer can take 30 kgs of food, which will weigh around 20 kgs after drying. The interruption of the drying process at night is an advantage because fast drying produces crusts that obstruct further drying. The moisture from the food soaks into the crust overnight, so the next day the drying process can continue unhindered. The warm air reaches 40-50°C.